Educating others about the Battle of the Bulge and the service and sacrifices of those involved is an important aspect of our Chapter's mission. Speaking teams provide an opportunity for students or group attendees to participate in a question-and-answer session and to see memorabilia. Hearing about this important historic time from people who experienced it personally adds a unique dimension. 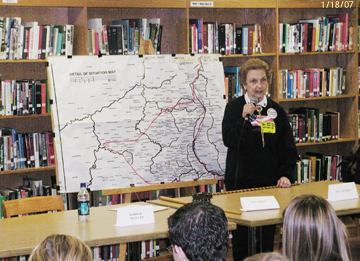 The Gateway Chapter has conducted over 570 presentations since the first at Windsor Middle School on November 9, 1995. Chapter members believe that reaching out to educate the younger generations is the greatest opportunity to perpetuate the memories and sacrifices. If you would like to arrange for a team to speak to your class or group, please contact our Educational Chairman Eugene Ganz or Dave Schroeder, Chapter President.